A report released by the main opposition Republican People’s Party (CHP) on the impact of an ongoing state of emergency in Turkey has revealed that a total of 111,240 people have been dismissed from their jobs, while 32,080 others have been suspended since a coup attempt last year. The report, released on the first anniversary of the coup attempt, was prepared by İzmir deputy Zeynep Altıok, who said during a press conference on Thursday that an average of 304 people had lost their jobs every day due to decrees issued by the Turkish government. “One hundred thirty-six people were sent to prison every day in the first year after the attempt, while 304 a day lost their jobs. A total of 45,678 teachers have been laid off, around 21,000 others had their licenses revoked, and 1,511,200 students were left without instructors,” Altıok stated. 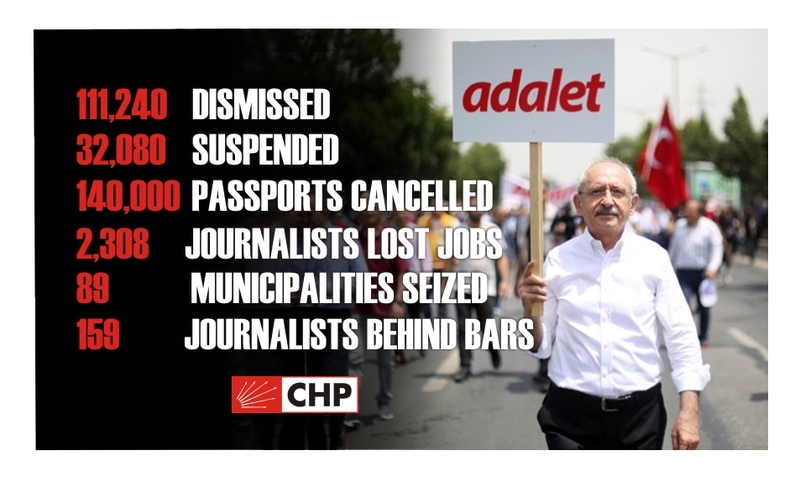 The report also claimed that 159 journalists are in Turkish prisons while 2,308 journalists lost their jobs after the government shut down their media outlets with decrees issued under the state of emergency. Some 140,000 people have had their passports cancelled, and government-backed trustees have been appointed to 89 municipalities in the past 12 months, according to the report. Turkey survived a military coup attempt on July 15 that killed 249 people and wounded more than a thousand others. Immediately after the putsch, the Justice and Development Party (AKP) government along with President Recep Tayyip Erdoğan pinned the blame on the Gülen group and declared a state of emergency across the country.